Local high school students share their unique experience as New-York Historical’s Teen Historians, tackling centuries of American history through guided research and pop-up exhibitions. Howard Thain is an artist whose work is featured throughout The New-York Historical Society. One of his most admired paintings is his painting of Grand Central Terminal, which my peers and I have selected as the basis of our group project. My individual topic within the group is the rise, decline and rebirth of Grand Central. The canvas reveals the hectic ambiance of Grand Central Terminal City. This painting was completed in 1925, three decades before the decline of Grand Central. Although Grand Central prospered for decades, an increase in suburban communities resulted in lack of travel inside New York City. As soldiers returned home from World War II, G.I loans encouraged the purchase of homes. As a result, modifications were made to the terminal city in order to accommodate city-dwellers. The original Grand Central Station focused on long-distance incoming traffic, long-distance outgoing traffic, and suburban traffic. A plan was created in order to merge all of these features into the new terminal devoid of chaos and confusion. 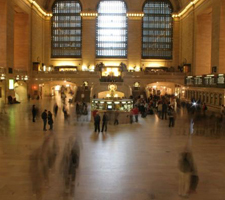 Grand Central’s new renovation was a reason it regained popularity. 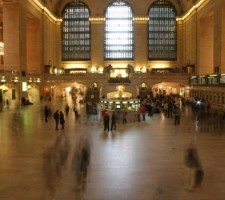 Grand Central terminal continues to attract tourism, and it serves as an area of commerce and travel. Thain’s painting, although almost 90 years old accurately reflects the atmosphere of Grand Central Terminal in the 21st century.